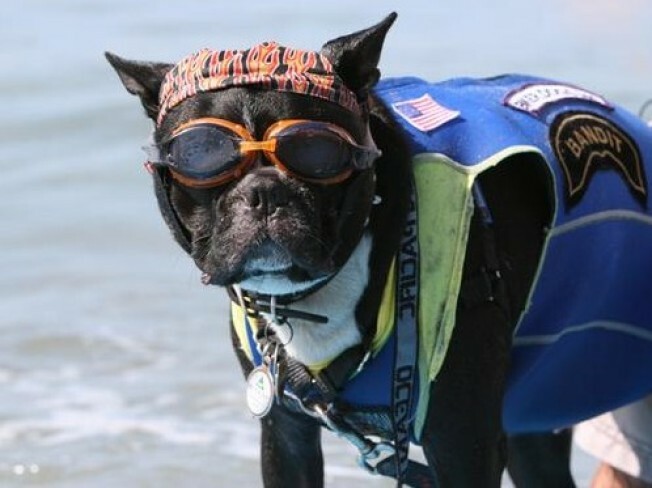 Bandit suits up for the Surf Dog Surf-A-Thon; head for Del Mar on Sunday, September 13th to see pups ride the waves. Stroll any calendar aisle and you'll see a) lots and lots of dog calendars, dogs sniffing roses, puppies in baskets, dogs in hats. And b) the ocean. Waves, sunsets. Seagulls. Seagulls at sunset, over the waves. And when two things we all universally like enough to hang on the fridge come together -- which is happening on Sunday, September 13th, at the Surf Dog Surf-A-Thon at North Beach in Del Mar -- and they're doing so to support something we all universally care about -- dogs in need -- it is like a bit of magic. Also magical: Seeing a dog on a surfboard. Why does this instantly lower our stress level? There's the pup, in his little floaty jacket, his owner nearby, riding the waves. The (human) surfers participating in the Surf-A-Thon will secure pledges for each wave they, and their woofer, catch. Then those pledges will help out hounds lacking homes. There are some other specs -- like how many waves are caught in 30 minutes -- so if you're thinking of participating, check the details. All we need to know: dogs on the beach. Helping out the Helen Woodward Animal Center. And a few dozen vendors selling us everything we need to hang in the sand and watch the action on a sunny September Sunday.